The K700, Ponnse Buffalo,T-150 and XPEN all share the same common thing. They pivot at their center. Which makes for awkward steering because they do not have automatic backsteer. When you go round a corner the truck does not auto align its wheels in one line automatically, you have to steer in the other direction to make it go straight again. Thanks to PressureLine we now have a way to add auto backsteer to these trucks. This example is done using the xml for the XPEN 8×8. 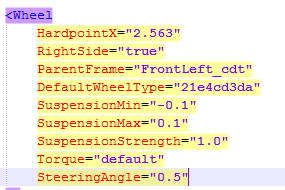 Open up the truck xml and add SteeringAngle=”0.5″ to all the front wheels. Not the rear wheels. Now go to TruckData and check if BackSteerSpeed=”0.05″ is present. If not go ahead and add to TruckData. After these little adjustments you will notice the XPEN, or K700 etc, now has backsteer enabled making it better drive. To do this on trucks downloaded from Steam Workshop open up the content folder of the workshop on your harddrive. Usually there two folders. Pick the one with the date from when you clicked Subscribe to a mod. Copy that zip somewhere else en unzip it. Edit the xml for the truck. And then copy paste the content into the Media folder, not the Media.zip file! Locate the zip, copy the right xml out, edit it like said, and move it back into the zip. (thanks hoanns for the tip). This way MP is kept working. How do do this to mods on the workshop? I can’t find what folder they are in. Added a bit of info on how to edit steam downloaded mods. your method will make multiplayer not work and truck names not work. instead locate the zip, copy the right xml out, edit it like said, and move it back into the zip. Yeah i dont care much for mp since i rarely have time to play it ;). But yes your method is added. Thanks! I know.. i will reply asap. Thanks! Ugh, I should add that it doesnt work in Multiplayer sadly, even with my method. Steam or Spintires will do a check if the file is modified. How do you control the speed of the backsteer?